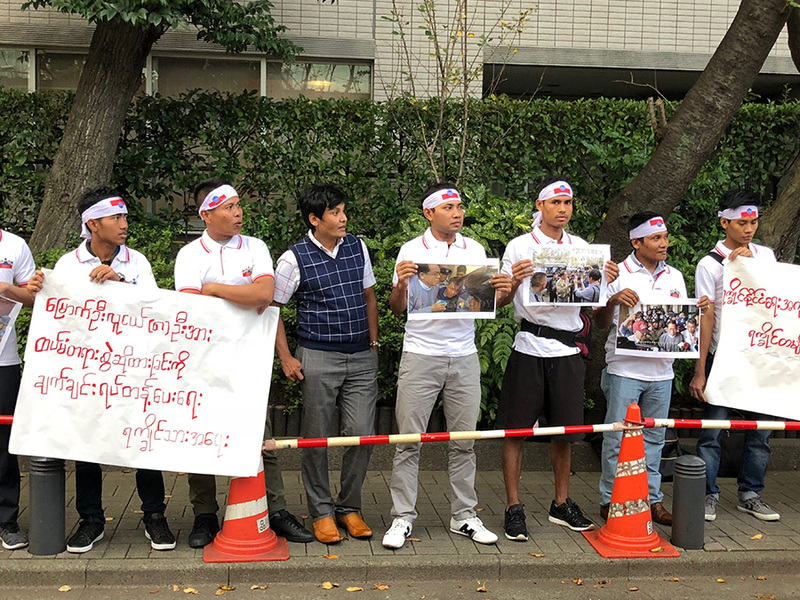 YANGON—About 70 Arakanese staged a protest in front of the Myanmar Embassy in Tokyo on Monday afternoon to demand the release of two prominent Arakan figures currently detained in Myanmar on treason charges. The demonstration was timed to coincide with State Counselor Daw Aung San Suu Kyi’s visit to Japan. Myanmar’s de facto leader has been in the country since Friday to attend the 10th Mekong-Japan Summit. 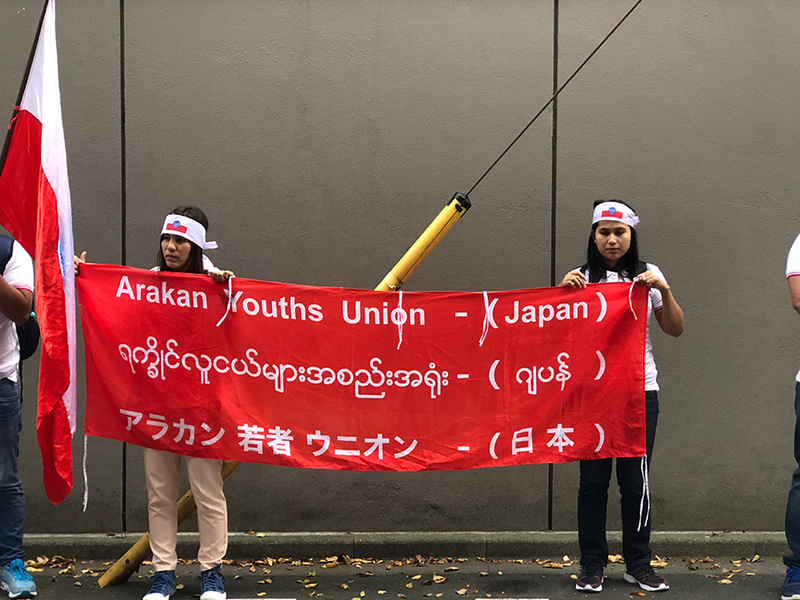 The rally was organized by the Arakan Youth Union (AYU-Japan), which comprises university students and others residing and working in Japan. The group requested permission to stage the rally from the Japanese authorities one month in advance, in line with procedures. In Japan, protest event organizers are also required to obtain approval from residents living near a rally event. AYU chairman U Soe Naing told The Irrawaddy over the phone right after the rally on Monday that the protesters made six demands of the Myanmar government: the immediate release of Arakanese politician U Aye Maung and author and social activist Ko Wai Han Aung, who were arrested in January and charged under the High Treason Law and the Unlawful Association Act; an end to legal action against those who have completed their sentences for participating in a spontaneous demonstration in Mrauk-U which was brutally cracked suppressed by police, leaving seven civilians dead; freedom of movement for Arakanese across the country; the immediate cleanup of the contaminated Thanzit River in Rakhine State’s Kyaukphyu; and the unconditional release of all Arakanese political prisoners. Protester Ko Thaw Zin Phyo said the demonstration began at around 3:30 p.m. Tokyo time and ended at around 4.40 p.m. He said the aim of the protest was to draw attention to what he described as the National League for Democracy (NLD)-led government’s mishandling of the situation in Rakhine and to hold Daw Aung San Suu Kyi responsible as a representative of the government. “We staged this protest on behalf of the Rakhine public because, as you know, there are a number of issues happening in Rakhine State… including the ban on Arakanese 11 ID holders traveling to other regions,” said Thaw Zin Phyo, referring to the numerical code that identifies the Arakan region on national ID cards. Daw Aung San Suu Kyi’s visit has become a source of conflict between the AYU and other Myanmar residents of Japan who support the government. The Myanmar Democratic Network (Japan) (MDN), a Tokyo-based group comprising members from various ethnic groups, released a letter on Oct. 3 regretting the AYU’s decision to stage a protest. Urging the AYU to rethink its position, the MDN statement said the protest could potentially have a negative outcome and would only sow disunity among ethnic groups. It said the protest against Daw Aung San Suu Kyi would only undermine the efforts of the current government to solve the current problems in northern Rakhine. MDN member U Mai Kyaw Oo said that while the elected civilian government was not perfect, it was doing what it could in the face of many constraints under the provisions of the 2008 Constitution and the group would therefore continue to support it. U Mai Kyaw Oo claimed that MDN had learned that other groups were coordinating with foreigners, international rights groups and “Bengalis” (a contentious term used by many members of the Buddhist majority in Myanmar to refer to Rohingya) to stage protests targeting Daw Aung San Suu Kyi during her visit. One of the State Counselor’s supporters based in Japan, U Tun Wai, was quoted in a report by Voice of America (VOA)’s Burmese-language version published on Oct. 6 as saying that Arakanese youth and “Bengalis” planned to jointly protest against Daw Aung San Suu Kyi during her visit to the embassy in Tokyo on Monday. AYU members rejected the claim and accused the dominant Bamar group of defaming the AYU. Ko Thaw Zin Phyo claimed that eventually some NLD lobbyists came to observe the rally along with Muslim colleagues on Monday. Daw Aung San Suu Kyi’s current six-day trip is her third official visit to Japan, but her first as a state dignitary. She visited once in her capacity as chairperson of the NLD and once in 2016 at the invitation of Japanese Prime Minister Shinzo Abe. Leaders attending the 10th Mekong-Japan Summit will discuss industries and infrastructure in the Mekong region.